Frank E. Barthe, 91, of Lancaster, went home to be with his Lord on January 27, 2018 at Hospice & Community Care of Mt Joy. Born in Altoona, PA, he was the son of the late Frank and Thelma (Lynch) Barthe. He was the loving husband of Janet (Meyer) Barthe with whom he shared 69 years of marriage. 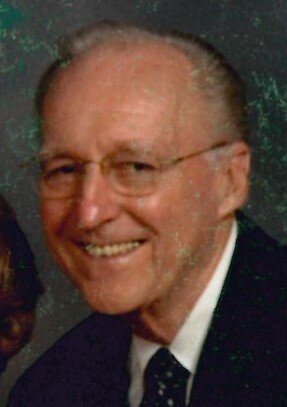 Frank was a longtime member of Grace Baptist Church of Lancaster where he was active for many years. He served in the US Army for the 106th Golden Lion Division in Germany during WWII. After he returned home, he went to airline school in Kansas City and went to work for Allegheny Airlines as a station manager. He was then a purchasing agent for CalDak and later for PA Malleable. Following that he was a sales representative for various companies. Surviving in addition to his wife are two sons, Rodney husband of Katheryn Barthe of Lititz and Kevin husband of Jamie Barthe of Elizabethtown; three grandchildren Vance, Abbey and Chad. Relatives and friends are invited to attend his funeral service at Grace Baptist Church of Lancaster, 1899 Marietta Ave, Lancaster, PA 17603 on Thursday, February 1, 2018 at 11:00 AM There will be a visitation from 10:00 AM until the time of service. Interment will be immediately following the service at Conestoga Memorial Park, 95 Second Lock Road, Lancaster. In lieu of flowers, those desiring may send contributions in Frank’s memory to Grace Baptist Church Lancaster 1899 Marietta Ave Lancaster, PA 17603 (please indicate “Missions” in the check’s memo. Our sincere sympathy to Rod, Kay & all of your family. Thoughts & Prayers are with you. I am sorry for your loss of Frank. May the “God of all comfort” embrace you and bring to your minds joyful memories. All the best wishes for your family at this time, take care.